Mr. F. Fdez-Riverola holds a Technical Engineering Degree in Computer Management by the University of Vigo, Spain (1994) and a Engineering Degree in Computer Science by the University of Oviedo, Spain (1999). He obtained his Ph.D. in Computer Science in 2002 by the University of Vigo, being honoured with the Extraordinary Doctoral Thesis prize in the technological area (2003). Founding member (2001) and actual coordinator of the Next Generation Computer System Group (SING, http://sing-group.org), he is currently a Professor of Computer Science at the Higher Technical School of Computer Engineering in the University of Vigo. Dr. Fdez-Riverola’s CV comprises (up to September 2017) 105 manuscripts; 173 congress communications (oral and poster); 36 books and book chapters; 20 projects; 35 R&D contracts; 3 patents; 4 intellectual property registries and 26 open-software projects. 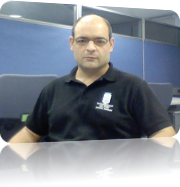 Dr. Fdez-Riverola is regular referee from 25 indexed Journals, being Advisory Board member from 6 of them. During his career Dr. Fdez-Riverola has supervised 9 doctoral theses, being also responsible for the direction of 17 advanced studies diplomas, 2 post-doctoral grants, 2 masters and 134 final projects.